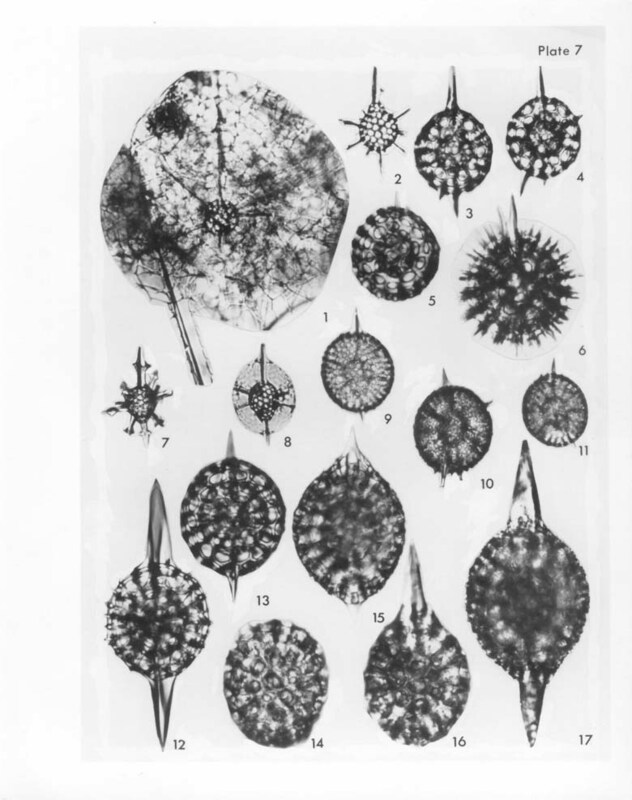 1 Spongosphaera streptacantha Haeckel; focus on inner shells, VS-R191a, 1-3cm, T31/0, 300x. 2-6 Druppatractus cf. pyriformis (Bailey); 2, medullary shell without cortical shell, VS-R-60a, 3-5cm, H4/0, 300x; 3, VS-R-27b, 1-3cm, B42/4, 300x; 4, VS-R-71a, 1-3cm, Y17/2, 300x; 5, VS-R-71a, 1-3cm, W23/0, 300x; 6, polygonal frames and by-spines well-developed, VS-R-136b, 1-3cm, D39/4, 300x. 7-11 Druppatractus irregularis Popofsky; 7, medullary shell without cortical shell, VS-R-106b, 1-3cm, Y46/0, 300x; 8, VS-R-60a, 3-5 cm, M26/1, 300x; 9, VS-R-27b, 1-3cm, K26/0, 300x; 10, VS-R-71a, 1-3cm, D15/2, 300x; 11, VS-R-71a, 1-3cm, L37/0, 300x. 12-13 Xiphatractus cronos (Haeckel); 12, VS-R-56a, 1-3cm, H55/1, 300x; 13, VS-R-27b, 1-3cm, C54/3, 300x. 14-17 Xiphatractus pluto (Haeckel); 14, focus on surface, VS-R-27b, 1-3cm, C15/1, 300x; 15, VS-R-27b, 1-3cm, S45/0, 300x; 16, focus on surface, VS-R-27b, 1-3cm, C15/0, 300x; 17, VS-R-27b, 1-3cm, C15/0, 300x.